The past couple of years have not been very good to the varsity baseball team. They have not won at least ten games in a while, let alone be competitive in their region. At the end of the 2015 season, Coach Horton felt as if he needed to bring in new blood to run the program. 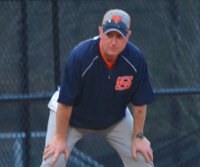 In early June, that change came when Coach Wally Pritchard was hired as the new head baseball coach. Pritchard has 21 years of coaching experience between both baseball and football as well as 24 years of Navy experience. “The Navy provided me a sense of leadership over young men, and that leadership is second to none,” says Pritchard. His most recent job was as head coach of Rutland High School in Macon. He was worked there for 10 years and was head baseball coach there for nine of them, As a head coach, his leadership and coaching experience has gotten him far with many accomplishments including: winning over 100 baseball games (to put that into perspective, varsity teams play an average of 26 regular season games a season), going to the playoffs 5 times as a head coach, and has a former player who is currently in the MLB. In terms of football, his accomplishments include having two former players who have played in the NFL and one former player who is currently playing at University of Georgia. “While I have all of those accomplishments, I feel as if the biggest accomplishment is making a difference in the lives of young men,” says Pritchard. “Coach Pritchard took over a 3 or 4 win program when coming to North Springs. He took the challenge of making North Springs baseball a relevant and winning program again because he wanted the challenge,” say Varsity outfielder Evan Murphy. Murphy continued, “He wants to develop these young kids and watch them become young men.” Coach Pritchard has really tried to change the culture of North Springs baseball since the day he started. “I have tried to get the players to believe in themselves, believe in the program I am building, believe in each other, work as a team, and work as one component, not multiple pieces, just one component,” says Pritchard on how he has tried to change the culture of the program, While trying to help his players believe in all of the things above, he has also instituted many new rules and programs for the baseball team. These programs include an offseason long toss program everyday after school in the offseason, required weight training (either class or 6:15 am twice a week), In terms of new rules and procedures instituted this year, those include: must have a clean cut and must be clean shaven during the season, strict punctuality rules, weekly progress reports, as well as just overall discipline. Another new thing Pritchard has instituted is before every game or practice, players must touch the goals that are taped on the wall before leaving the dugout. With North Springs being at the bottom of the standings in the past couple of years, many were confused on why Pritchard left a program at Rutland that was a year-in-year-out playoff team after so many years there. “North Springs chose me. it was a challenge and a chance to build another program,” said Pritchard when asked about why he chose to leave Rutland for North Springs. Being a military man, Pritchard believes in discipline. His coaching philosophy is “to do whatever has to be done” and that shows through his discipline, programs, and team. It has showed on the field with the varsity baseball team currently with a 2-2 record in region games (as of March 8th). With the motto of “the only easy day was yesterday”, the baseball team has truly embraced it, working harder everyday and playing harder everyday.